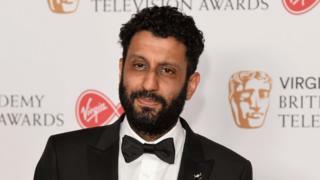 Adeel Akhtar has made Bafta TV history for being the first non-white best actor winner in the awards' 62-year history. He was recognised for his brilliant, tortured performance in BBC Three drama Murdered By My Father. It featured Akhtar as a man who murders his daughter in a so-called honour killing, after she is "promised" to a man but falls in love with another. The significance of his Bafta win was noted by the drama's screenwriter. Vinay Patel tweeted: "First non-white fella to win a #Bafta TV award for best actor? This guy. (Not me, obvs)." Akhtar first came to prominence as Muslim extremist Faisal in Chris Morris's 2010 film Four Lions. He also starred in Channel 4's sci-fi drama Utopia and Sky's comedy drama Trollied. His credits also include Apple Tree Yard and The Night Manager. Previous non-white actors to be nominated in the best actor category include Idris Elba, who received a nod last year for Luther but lost out to Mark Rylance for Wolf Hall. David Oyelowo was also recognised in 2010 for Small Island but the award went to Wallander's Kenneth Branagh. But prior to that, there were no non-white actors nominated in the 1990s or 2000s. Art Malik got a nod for the prize in 1985 for Jewel in the Crown, while Sir Ben Kingsley, whose father was Kenyan-born and of Indian descent, was nominated the following year for Silas Marner. Sophie Okonedo was the first non-white woman to be nominated for a TV Bafta for best actress in 2010. But it was Georgina Campbell who became the first non-white actress to win the prize, in 2015. Her performance in BBC Three's Murdered By My Boyfriend beat Sarah Lancashire, who was nominated for Happy Valley, and Sheridan Smith, who had been nominated for Cilla. Nikki Amuka-Bird was nominated this year for NW but lost out to Lancashire. But it was still a decent night for diversity at the ceremony, with Damilola, Our Loved Boy picking up two awards. Wunmi Mosaku won best supporting actress and the programme - about the murder of 10-year-old Damilola Taylor and the family's fight for justice - also won best single drama. In an emotional acceptance speech, Wunmi said: "This is so bittersweet and I'd like to dedicate this to the memory of Damilola and his mother Gloria [who died in 2008]." The People vs OJ Simpson: American Crime Story won best international show, while Exodus into Europe - which gave refugees cameras to film their own, often dangerous, journeys from their homeland, picked up best factual series. Baftas TV host Sue Perkins also put gender firmly on the agenda, taking aim at sexism in the TV industry: "I know what you're thinking. Not another woman hosting an awards show, when will it end?" she said. "I find it a little like Halley's Comet, just a little less frequent." She also joked the best actress nominees were paid "just under the same amount as the leading actor" and introduced the award for best male performance in a comedy programme with: "It's the age old question: Are men funny?" And actor James Nesbitt announced his support for the Equal Representation for Actresses campaign when introducing the best actress award. "For one female role there are three male roles," he said. "This is an inequality that is not only about our industry, but it is an inequality that is absorbed by everyone on their screens every day. "As the father of two children - two girls - this should change."